This week’s gospel is the very famous story of Zacchaeus. This poor little guy (OK, not that poor, but certainly little) climbs up a tree to see what all the fuss is about Jesus, who happens to be walking through his city of Jericho. 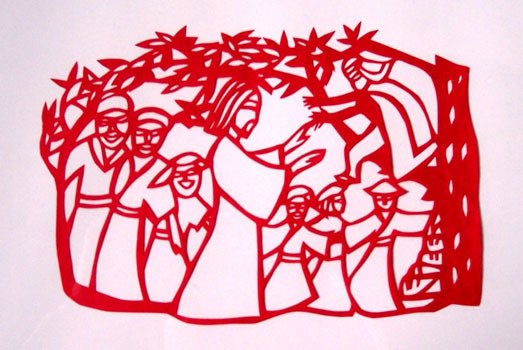 Jesus surprisingly stops under the tree, points to him, and says “I’m am staying at your house today!” Zacchaeus was overjoyed and welcomed him into his home mush to the disgust of the onlookers, for Zacchaeus was considered an outcast and a sinner because of the way he did business. But as soon as he comes down, Zacchaeus makes amends for his wrongdoings by way of over-compensation. And by doing this Jesus declares that salvation has come to this house. Occurring only in this passage of the whole Bible, the name ‘Zacchaeus’ means pure; and this gives the key to the whole passage. From the first line (as consistently happens in scripture) there is a discord. ‘Zacchaeus’ is anything BUT pure! He is an outcast who ripped people off! So, why the name Pure? Through the story we see a change in Zacchaeus, from a man who wanted to see what all the fuss was about – just like any other by-stander – to a man who was profoundly touched by the presence of Jesus in a way that drove him to make amends for his life of sin. We see a change in him from manifest greed to spiritual poverty; from unclean to purity. I do not pretend that this was all his spiritual life could give him, but he entered the path that offered a fuller life in Christ: a path that leads to purity. There is a certain purgation involved with a pure life; a separation of ourselves with our past sins; a separation of what we used to hold dear (money for Zacchaeus) with what we now see as more important; a new recognition of what it is for which we truly long. And it all starts with an encounter with Jesus. Just as Zacchaeus searched Jesus out, so must we. Zacchaeus, no doubt, had heard about this great man who was coming his way. Interest had been sparked, but he was still a by-stander like many today who have heard the word and not lived it. He could have easily stayed among the crowd and have not got the chance to even see him – but he chose to go, quite literally, above and beyond. He got out of his comfort zone for Christ and was rewarded with the gift of purity of heart. How often do we go out of our comfort zone for Jesus? Its easy to serve him on our terms, but he wants us to serve him on his terms. This make us (me) uncomfortable, but it must be done. For it sets us on the road to purity. Posted on October 31, 2013 October 31, 2013 by The Buffet Catholic	This entry was posted in Uncategorized and tagged bible, catholic, gospel, Jericho, Luke, reflection, Scripture, Zacchaeus. Bookmark the permalink.